This is a delicate, compassionately told movie, one which in less capable hands might spill over into the realm of the precious or the patronizing. 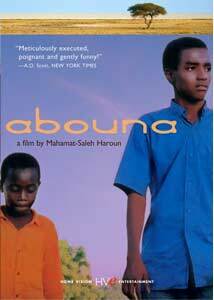 But director Mahamat-Saleh Haroun tells a spare story in a restrained style, and gets his audience to empathize with his characters; in the process, we learn more about life in Chad, simply incidentally, than from any Western news outlet, which makes time for life in Africa only in instances of extreme violence, weather or slaughter. The story focuses on two brothers: Amine, the younger one, has terrible asthma; Tahir, the older one, at 15 is on the cusp of manhood, an issue further complicated by the recent departure of their father. The boys hold out hope that the father is to return; but the looks on their faces, and the behavior of their mother, Achta, communicate to us that this nuclear family is never to be reunited again. The boys set out on a quest to find him, taking them to the Chad/Cameroon border; he never turns up, but they do unearth some of his secrets. Soon the unruliness of the boys turns to petty criminality�they steal a reel of film from the local movie theater�and they're too much to handle: Achta reluctantly but necessarily takes her boys to a nearby Koran school, part orphanage, part juvie. Her own despair and decline is even more marked than those of her sons; the fact that we never see the family together only makes the sense of loss and deprivation that much more pungent and universal for us. This is no mere travelogue, but it is filled with fascinations about the lives of those in such a rural African community; the poverty isn't desperate, and sometimes there's even running water. Still, many of those seen here have a deadness in their eyes, the look of hopelessness that we know won't be redeemed any time soon, and certainly not before the movie is over. Image Transfer Review: Strong transfer, with a steady palette and little visual interference. Audio Transfer Review: Smooth sailing here, too, though unless your Arabic is especially well polished, you'll probably be reading along with the subtitles. Extras Review: In an accompanying interview (22m:40s), director Mahamat-Saleh Haroun discusses his childhood and education, and provides some useful cultural context for his feature. Two short films, also on the disc, give a sense of the evolution of his style�Go� Go� (14m:40s) works on the same canvas, though it's more lighthearted; B400 (03m:03s) is set in Paris, and demonstrates Haroun's affinity for and empathy with children. In an essay that comes along with the DVD, Phil Hall goes all over-the-top fanboy on us, calling this, among other things, "a perfect film," when, really, there's no such thing. A heartfelt and memorable story from a part of the world that doesn't often make it up on the movie screen.